No one wants the smartwatch category to succeed more than I do. As a kid, I dreamed of enjoying TV on my watch, or video calling "HQ" (or more likely, my mum), just like Penny in Inspector Gadget. Most smartwatches offer a taste of this experience, but not the whole enchilada. Enter Neptune Pine. 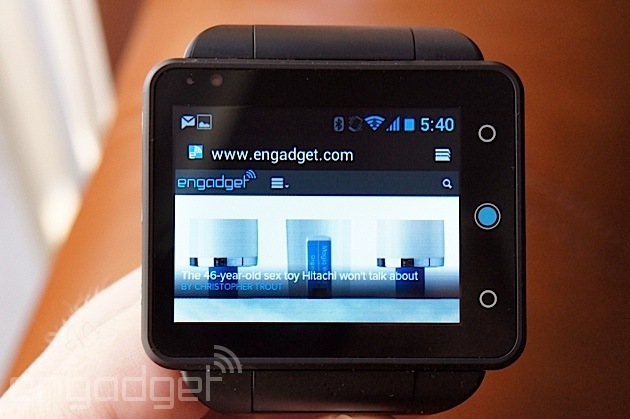 It's a smartwatch by the loosest definition: it's a small Android phone in a wrist-strap. Whatever you want to call it, it'll do both of the above things, and more. It's also a genuine Kickstarter success story -- like, one, where the product came out and everything! It might not be the first smartwatch/phone mash-up, and it's (definitely) not the last. But, it's one of the more ambitious takes on the idea I've seen. I spent seven days with it (and no other phone) to see how my dream stands up to the reality -- and whether a watch could ever replace your trusty mobile. The galleries tell much of the story, so be sure to jump in when you see them. I'm not joking when I say it's a small phone. It has a 2.4-inch (320 x 240) display, has a micro-SIM slot, runs Android (JellyBean), comes with 512MB of RAM (plus 16- or 32GB of storage) has front and rear cameras and, well, pretty much everything you'd expect from a phone (GPS, apps, headphone jack etcetera). 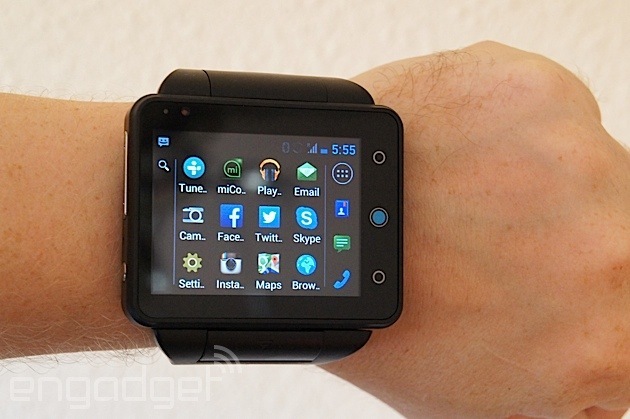 It's a chunky device -- pretty much what you'd expect a wrist-phone to look like. It's also undoubtedly bigger than any watch I have ever used. By some margin. Dive in to the gallery to see for yourself. If the form factor isn't an issue for you (the strap comes with two choices: like it, or lump it), there's the software to consider. 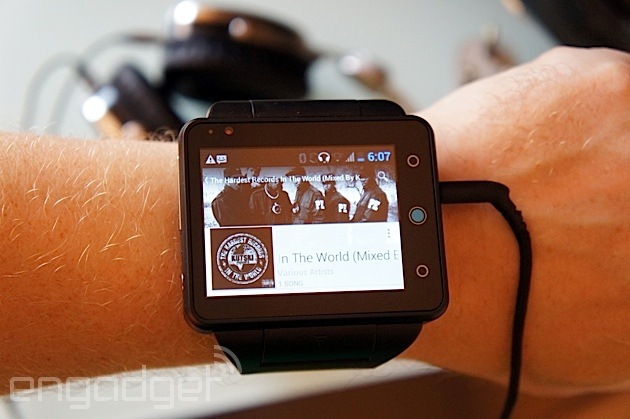 Most smartwatches come with a custom user interface (until Android Wear showed up). Neptune's plumped for stock Android, just as you already know it. While the screen size is uncommon these days, the resolution isn't wacky (HTC's Wildfire, for example, was/is 320 x 240), so theoretically most apps should work. How well is something of a case by case journey of discovery. But, if you're wondering what Facebooking, tweeting or dialling a number from your wrist would be like, you'll see in the gallery below. In short, with a bit of work, the Pine can feel just like your a regular Android. But, not without some important caveats. This raises the question: If a proprietary interface can't win people over, and stock Android has challenges, where to do watch-phones go from here? Let's tackle the (other) elephant in the room. The biggest barrier for wearables is how they look and feel -- a nut that's yet to be cracked, despite best efforts. This shouldn't be a surprise though, given that, well, you're wearing these things. The Neptune Pine is big, chunky, and a bit uncomfortable if worn for long periods. It also has no style customization options (at time of writing), and, well, it's fairly ugly. Like babies, though, some parents (owners) will love it regardless -- but it's definitely high on the dorky scale. I'm okay with it, but others, many others, won't be. Of course, that might not be a problem if the user experience is delightful. Sadly, that's not quite how I'd describe it. The lack of Google services/Play store out of the box means it requires some noodling to get it just how you want it. For those mainstream consumers who could see past the exterior, the Play hurdle is likely enough to turn them off. Then there are the small idiosyncrasies, like having to take it out of the strap (which can be a clumsy task) if you want to take a picture -- so no impulse snaps we're afraid. The minor gripes continue. The headphone experience is only worth thinking about if you're using a Bluetooth set. I think it's nice to have the option of a 3.5mm line out for a number of reasons, but practical headphone use isn't one of them. Put on some headphones now, and tuck the cable under a watch -- you'll soon see what I mean. More pressing (no pun intended), are the issues with the display. The touch detection is frustrating. Typing is possible, but quite often it can feel like you're drunk, as you mash the tiny keys and the wrong letters or options respond. It's serviceable, but it's not perfect -- SwiftKey works, and improves the experience somewhat. But input is a fundamental that companies will need to figure out. It can also be a little uncomfortable holding your wrist in the right position for typing/watching video. This is exacerbated by the fact the Pine's screen has fairly poor viewing angles. Worse, is that if worn on the left wrist (for most right-handers), it's that angle you'll be viewing from that suffers most. The last of the bad news is that the battery life is just okay enough to see you through a day. But it's usually a close call. Displays, input and battery-life: none of them new challenges for smartwatches. There are positives though. Using apps like Skype, maps, and fitness loggers is, dare I say it, an improvement on the experience you often get on a phone. Voice calls do work, and still feel kinda "fun" or futuristic. You'll definitely want to have a hands-free ready, but it's not a bad experience. It's also a good general purpose media player. While you wouldn't want to watch a film on a smartwatch, it can make a great mp3/music player, and there's definitely a novelty factor to watching YouTube videos on one (that, plus Skype, satisfies my childhood dreams!). The bottom line, though, is that Pine only proves what plenty already suspected -- a watch can't usurp your phone, at least not yet, not permanently. The Pine has enough going for it though that it deserves, and already looks to have, a dedicated fan-base. Android tweakers, tech-savvy folk who can tolerate low-level gripes for a device that does more things, hobby-hackers and lovers of geek-chic (I kinda warmed to the looks of it myself in the end) will get on well with Pine. There are other entrants into this market. Samsung's new Gear S is definitely a more refined take on the idea (in design at least, but the UI is yet to be proven). Perhaps the hybrid watch/phone will mature into something more practical and public-ready. But that time isn't now.